We don’t think it will be too long until strategies and techniques for integrating telemedicine into medical practice is a standard part of provider training. At the moment, however, video visits are a new thing for most providers, so it makes sense that there are many questions about how to be successful launching the new option for patient care. We are lucky to speak with providers every day who are well established in their telemedicine practice and many others who are just starting their journey. We’ve noticed that there are five things that thriving telemedicine practices have in common. How does the old saying go? If you don’t know where you are going, any road will take you there. Don’t make that mistake. Start your telemedicine program by outlining exactly what you hope to achieve and how it might augment or even transform your practice. Revisit your goals periodically to make sure that you are always headed in the right direction. Do you hope to increase revenue by seeing more patients each day? Introduce flexibility to improve work/life balance or offer non-traditional appointment hours? Maybe you want to expand the geographic reach of your practice or provide new services such as lifestyle coaching for weight loss or smoking cessation. Whatever your objectives, you’ll be in a better position to reach them and measure your progress if they are well defined and documented. The application that you use to execute your video visits will be the face of your telemedicine practice. Of course you want to look for a solution that is easy to use for both your staff and patients, but there are other considerations as well. For example, reimbursement for remote encounters varies by state and insurer. Your telemedicine platform should be able to pre-verify that each appointment will be reimbursed and the vendor should provide assistance should you run into any payment problems. You’ll also want to be sure that your team and patients can get technical support if necessary. Of course, patient privacy is paramount, so you’ll want to vet that the solution is encrypted and HIPAA compliant. There is somewhat of an art to making the video visit experience comfortable and helpful for patients. The basics include ensuring that you are in the right environment for each encounter with no background distractions, making eye contact with the patient by looking directly into the camera and avoiding unnecessary movements. Whether the visit is being conducted in the office or from home, providers should dress as they would for an in-person visit and give the patient ample time to ask questions and ensure that follow up instructions are clear. Marking doesn’t necessarily spring to the top of one’s mind when thinking about healthcare providers, but it is essential to have a plan for making sure that patients and the community know about your telehealth program. If you have a website, be sure to have information about the availability of video visits. Provide information about the benefits for patients and include details about the quality of care that is offered by the approach. You might put fliers or posters in the office. Some telemedicine providers will even help with your marketing efforts by leveraging email campaigns and online appointment setting. Your staff can also become one of your most valuable marketing assets. They should be well versed in when to recommend a telemedicine visit when scheduling follow-up appointments and answering incoming calls. It’s unlikely that your telemedicine program will be executed flawlessly right out of the gate. That’s why it is important to enlist your patients and staff as partners in your effort to perfect your approach. The most successful practices are deliberate about getting feedback and making the necessary adjustments to ensure that telemedicine works well for everyone. Simply asking patients for their input at the end of each encounter can provide valuable insight. It also helps reinforce your dedication to an outstanding experience at every opportunity. 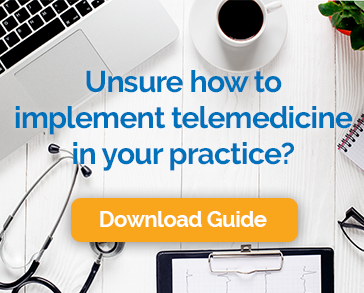 These best practices will go along way to ensuring that your telemedicine program is both popular and profitable. Video visits are a win-win for patients and providers. With a thoughtful and strategic approach, benefits will be realized across the board.